Manchester United have been handed a huge transfer boost after reports emerged in the Spanish press that Real Madrid are open to the idea of selling Toni Kroos to interested parties, if they can pay around £90m for the 27 year old German. The player has long been admired at Old Trafford as his passing range has an uncanny similarity to United legend, Paul Scholes who the player himself admits he admired while growing up. Prior to his move to Madrid in 2014, he was reportedly close to joining our club but eventually joined the European champions at the time. Manchester Evening News report that Real Madrid president, Florentino Perez is willing to sell Kroos in a bid to free up cash for the seemingly improbable purchase of Brazil superstar, Neymar who is reportedly disillusioned with life in Paris after a world record move just last summer. Kroos is widely regarded as one of the best players in the world, and would command a huge transfer fee, a fee United would have no issues with coughing up. Perez is reportedly obsessed with getting Neymar this summer or next, and is willing to sell a number of fist team players to fund the move. 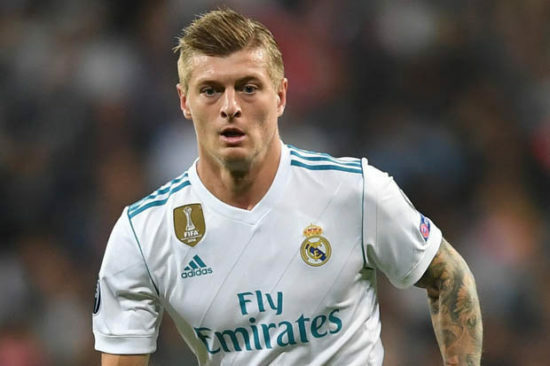 It is however not clear whether Zinedine Zidane will sanction the sale of Kroos, who has already made 22 appearances this season, and is a pivotal part of the Real Madrid midfield alongside Luka Modric and Casemiro. United will jump at the chance to sign Kroos as his qualities are not unknown throughout the world of football. He is a central midfielder known his passing, shooting and overall awareness of what goes on around him, and he could be United’s answer to our midfield woes, with Paul Pogba trying too hard all by himself. Since joining the Spanish giants back in 2014, he has won the league once, The Champions League twice and a host of other trophies. Kroos is a good player but for real Madrid to demand an astronomical fee for player they bought less? That is absurd. Real Madrid always want to sell their players very expensively. Is only Mourinho who can do it with Manchester United. With all the monies he had spent with all the criticism, where are we? 15points difference.